Maybe someone will know something about the attached accident. It is not possible to make out the loco number, but the wagons suggest South Wales, possibly fairly well to the north end of one of the valleys. 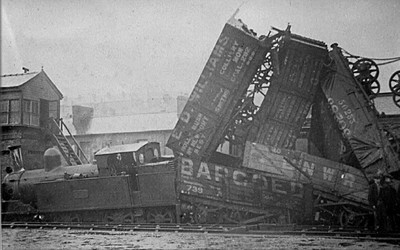 This is the accident at Ebbw Vale, 13th November 1911. According to W W Tasker’s “Merthyr, Tredegar & Abergavenny Railway and branches” (OPC, 1986) an express goods train from Abergavenny to Merthyr (a Coal Tank plus 27 wagons plus a brake van) got out of control when approaching Ebbw Vale Junction. The runaway was diverted onto the branch line – downhill at 1 in 42 – with this result on arrival at the trap points in Ebbw Vale station. The book contains two other views of the accident but the loco number is not legible in either. This accident occurred at Ebbw Vale on 13th November 1911 as a result of mining subsidence. The engine is Coal Tank No. 277. Mike sent in a photo with a different view of the locomotive.